At the end of time, people of every language will worship around the throne of God. Studying Spanish at BJU, you’ll learn how language shapes how people think, and how you can use this knowledge to more effectively communicate as an educator. 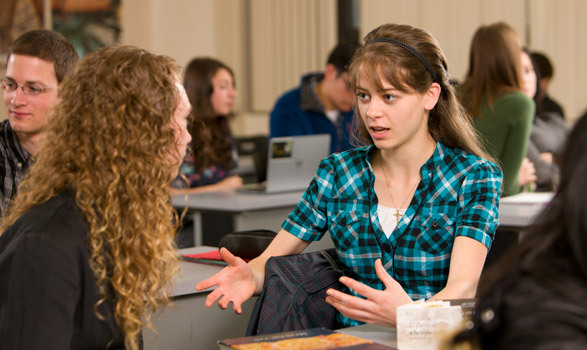 BJU’s Spanish education program focuses on giving you a strong proficiency in the language. As you gain fluency, you’ll develop your knowledge and communication skills in writing, speaking, history and literature. Because culture and literature are extremely important to many Spanish speakers, courses in these areas help you understand their world and connect with them on a deeper level. Your courses and opportunities outside of class will prepare you to maintain an advanced proficiency in speaking under pressure. You’ll also take several methods-focused classes that will stimulate your creativity in teaching and equip you with diverse instructional methods and knowledge of current educational technology. You’ll gain real-life experience in the classroom, culminating in a semester of directed teaching during your senior year. You’ll have the opportunity to work with a teacher in a local public school, as well as a BJU professor, who will give you feedback every week. BJU’s Spanish education program is approved by the South Carolina Department of Education, leading to initial South Carolina state licensure (licensed to teach Spanish for grades K-12 in a public school setting). The ability to connect with people from all walks of life—as Jesus did with farmers, soldiers and business professionals—is one of the many skills you’ll strengthen through the BJU Core. Courses in Bible will help you articulate what you believe and help you confidently share why you believe God’s Word. And through subjects such as history, economics and science, you’ll be better equipped to weave biblical truth into your daily conversations and interactions with others. 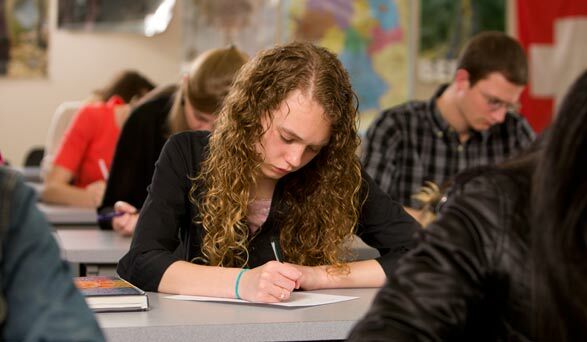 Spanish education is a very involved program, and much of your class schedule is already predetermined. It’s essentially the Spanish program, with electives in education taking up the remainder of your schedule. If you still wish to take additional Bible or liberal arts courses, you may want to explore the option of taking courses via BJUOnline over the summer. As a member of an English-speaking church in town, I had a burden to expand my church’s influence through Spanish. The Lord has allowed me to start a beginner’s Spanish program in which I have been teaching a dozen home school students once a week for the past nine months. Lord willing, one day each of my students will be able to use Spanish as a tool to spread the Gospel to the lost. Teaching Spanish continues to grow in its needs for professionals to fill its roles—BJU receives many more requests for foreign language teachers than there are graduates to fill the positions. Middle school math and Spanish teacher at The Abbie School, Tucson, Ariz. Teacher, Whitehall Elementary School, Anderson, S.C.
Hillcrest High School, Simpsonville, S.C.
Greer Middle College Charter High School, Greer, S.C.
Riverside High School, Greer, S.C.
Greenville Classical Academy, Simpsonville, S.C.
Foreign language teacher at Bob Jones Academy (Middle School), Greenville, S.C. Teacher, Northwood Middle School, Greenville, S.C.
BJU offers students a variety of ways to network with employers and organizations. A multitude of job opportunities are posted each year on Career Central, our online job board. In addition, over 60 businesses and 150 Christian schools/mission boards/Christian organizations come on campus to recruit students through on-campus interviews and job/ministry fairs. Career Services also helps both students and alumni through career advising, resume preparation, job search assistance, recruitment conferences and more. Greenville County is home to more than 36,000 Hispanics—that’s more than 8% of the total population. Many Spanish-speaking churches have been established in the Greenville area, and many English-speaking churches have started Spanish-speaking ministries. You’ll have many opportunities to use your Spanish-speaking skills for the Lord in ministries around the Upstate. Create and implement standards-based unit plans that are engaging and effective.